Carex rosea.mature plant.© G. D. Babeau. friendsofthewildflowergarden.org (accessed 12/2014). Carex rosea is a perennial C3 sedge (Basinger 2002), densely tufted, fertile stems to 80 cm tall, erect, to 2 cm thick at base. Leaves about 0.2 cm wide. 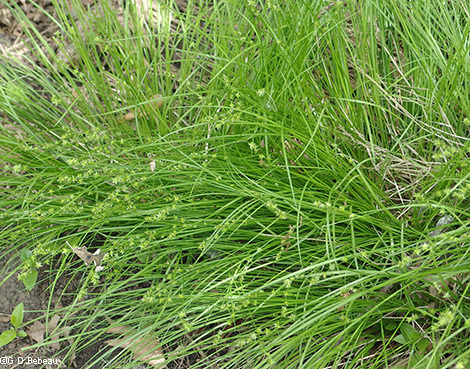 Carex rosea in bloom. Bobs Brain on Botany. bobklips.com (Accessed 12/2017). Flowers (perigynia) pale green, narrowly elliptical, 0.3-0.4 cm, base wedge-shaped to rounded, spongy, tapering to sharp, vaguely 2-toothed tip, achene set low in perigynia, stigmas coiled once or twice, inflorescence of small, sessile, clusters of 5-12 perigynia along upper stem, radiating in all directions giving a spiky appearance to clusters, male flowers at tops of spikes, lower spikes well separated, spikes near top crowded, scales of perigynia short; blooms May-June. 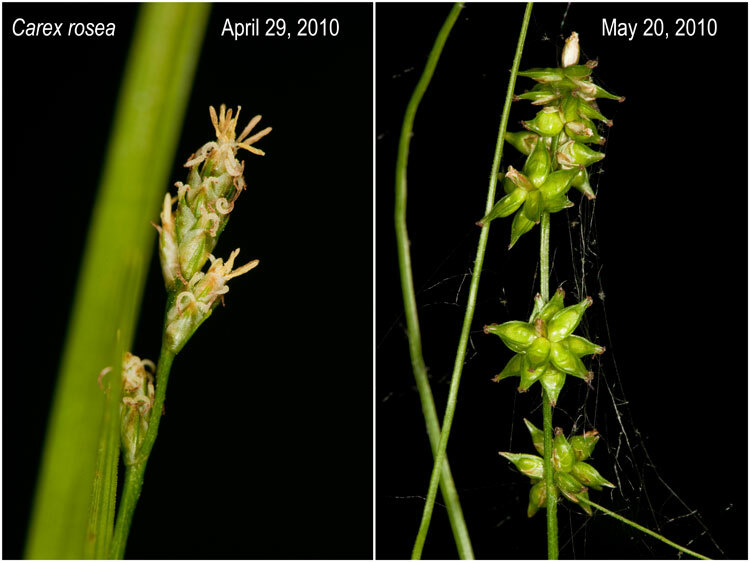 Carex rosea inflorescence close-up. Copyright 2002-2009 Patrick Alexander. Creative Commons Non-commercial, no derivitives license. polyploid.net (Accessed 12/2017). Habitat: Moist woods, usually near wetland edges, shade tolerant. 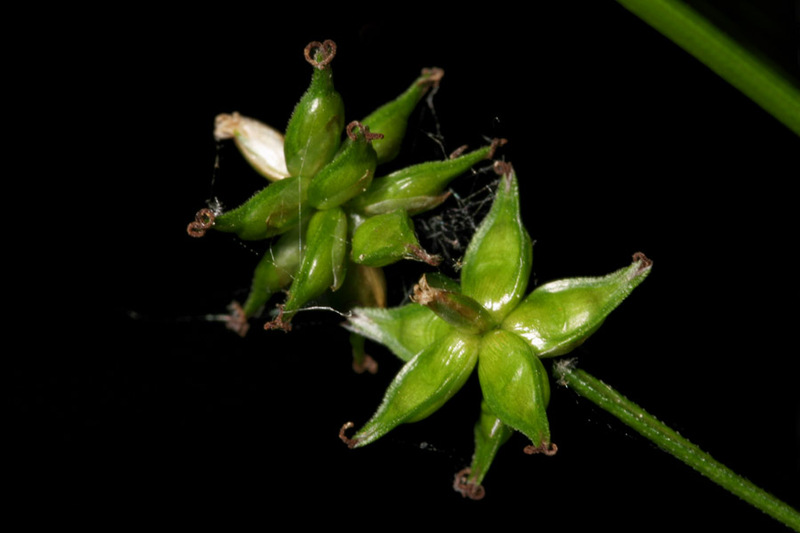 Notes: It is extremely difficult to tell from C. appalachica or C. radiata. Taxonomically these are referred to as C. rosea complex (G. Moore, personal communication). Dispersal to and establishment in new sites in successional forest, contiguous to old regrowth stands, has been calculated at a rate of 2.17 m/yr (Matlack 1994).